Episode Review: BONES, "The Rocker in the Rinse Cycle"
Sorry for the late post on this week's Bones, but I skipped it in favor of Community, and I didn't get to watch until now. 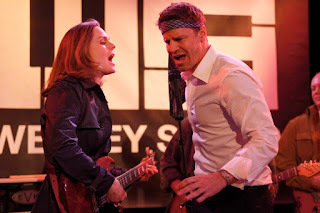 After catching up on Hulu, I'm glad that I didn't waste too much time on Bones this week because "The Rocker in the Rinse Cycle" was by far one of the weakest episodes to date. The Case of the Week was absurd, and the reveal of the killer was sloppy and unconvincing. The resolution just felt very tacked on and unbelievable that some random guy with little to no screen time ended up doing it, and his justification was beyond idiotic. The only upside of the CoW was we got to see Booth and Sweets geek out about rock 'n roll, but unfortunately this week's theme also led to some really low points as well...namely Brennan. Once again this week the audience is subjected to Brennan's complete inability to comprehend anything normal, and while it used to be cute and quirky, her social ineptness has become grating and unfunny. We're supposed to believe that she is a fan of "Hot Blooded" and Toad the Wet Sprocket, but has no idea about the Rat Pack. Seriously? Oh, and she doesn't understand rock 'n roll or its cultural significance but can wail on a guitar with zero practice (yes, I know she knows how to play some random ritualistic mandolin , but still). Don't even get me started on how she picks at Booth and his relationship with Catherine. I just can no longer stand Bones and her little peccadillos because they are so unbelievable, and they totally take me out of the show. Other odds and ends: I did enjoy seeing Hodgins and Vaziri bond over baseball, but once again people not understanding why baseball is important was annoying. I was glad to see Angela show her knowledge about music and instruments because it fleshed out her character a little bit more (although it shouldn't be surprising considering who her father is). Cam dating her daughter's gynecologist just seemed creepy so I skipped past most of that storyline. Right now, I'm pretty sure I'm going to give up on Bones as a whole because I can no longer stand Brennan's character, which is a shame because I love Seeley and Sweets. Hell, I'd watch the show if it was just about Booth and Sweets solving crimes and Brennan was brought in every once in a while. Screw B&B, we need us some BS.